Good day ladies and gentlemen! As you might be able to tell from the title, today we’re having this list of 21 healthy chicken recipes. And it is, of course, for the ultimate serving at your own family table using your own devices, with healthiness and simplicity as the two top priorities. I can bet with certainty that these recipes are not only for the white meat lovers to fall in love with, but also for all the Pollotarians, Semi-vegetarians and Flexitarians and regular meat lovers out there. Behold and be amazed. I bet the nutritious nature of chicken meat is no longer in dispute for being lean and super low-fat. No matter it’s breasts, thighs or legs that you’re using, please rest assured that your meals are packed with all the lean protein. They’re all allies for every shedding-a-few-more-pounds plan of yours. As protein is an ultimate metabolism booster, your body will naturally burn even more calories whenever protein is digested. So yes, chicken dishes, after all, are super beneficial for weight-loss schemes. Anyway. 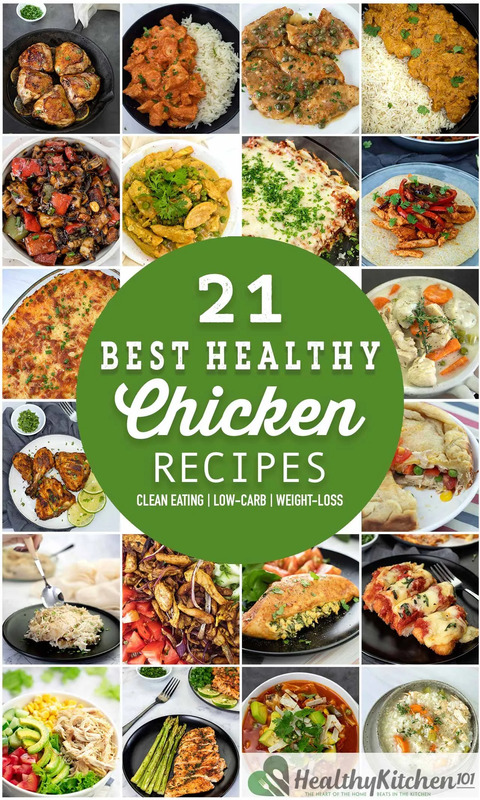 I am here today, with pride, to present you this ultimate list of 21 healthy chicken recipes that’s hearty to the brim. You know, in case things have been hard to come up with recently, something new to replenish dreary days of yours wouldn’t be too redundant. Of course, more table companions are always welcomed! Packed with cheese and ready to be served smoking hot in just 30 minutes, I present you Spinach Stuffed Chicken Breast. The dish truly is a sweetheart for those who are following LCHF Keto diets. It’s low-carb, hearty and fulfilling – surely promises you a high-end gourmet experience with only in-store ingredients. The recipe is fabulously suitable for either special family occasions or regular week meals. Let’s imagine ripping the roasted chicken breasts in thin strips and tossing them to a quick side salad. Oh dear, definitely a superb way to pamper your tastebuds. This oven-baked chicken breast dish is simply basic, juicy and definitely an all-time favourite for your family table. It’s luscious and fulfilling at its best! Not only an ultimate metabolism booster, this dish is the go-to worldwide for its tasty, creamy sauce base. Check out this Chicken Tikka Masala recipe that I made from only types of herbs together with a one-off tomato spice. The outcome? An inimitable, red hot aromatic dish! This wok-fried chicken dish is truly a well-known Chinese cuisine mainstay. Kung Pao chicken is sweet and sour, starchy and a bit intense at the tip of your tongue, yet never too spicy. Its balancing taste is exactly what hooks people up. This dish is the pick in Chinese culinary repertoire thanks to the substantial contribution of the sauce base. Together with a few splashes of scallions, garlic and ginger, this recipe possesses all the well-known qualities of Chinese cuisine. Ready to figure it out? With salty, melting parmesan, provolone and mozzarella, this Chicken Parmesan tastes just like heaven. Together with crispy bread crumbs and sharp-tasting tomato sauce, this dish is sure to trigger your tastebuds. 6. Chicken Shawarma – the healthy chicken recipe in my household! Chicken Shawarma has been long known as one of the all-time favourite street foods in the Middle East. As a matter of fact, it is actually an Arabian fast food which originated in Turkey. As a true Middle Eastern dish, people tend to enjoy Chicken Shawarma in pita breads with pickles. It often comes with heaps of veggies and zesty drizzles of tzatziki sauce in the wraps, too. Here’s one amazing feature: Add in a few veggies chops and there you have a whole new Chicken Salad Sandwich for breezing days off-work. Endless possibilies, isn’t it? Don’t forget to enjoy it with your favorite fellows too! The golden-brown hue sauce also appears as a true burst of flavor. That was our conclusion just minutes after we finished the Honey Butter Chicken at our family reunion. The sweetness from honey and the pungent aroma from sautéed garlic truly slices through the fragrant, browned butter. Bet you couldn’t ask for more. Golden, crispy and Parmesan-crusted, these super tender chicken fillets are glossy, coming in a lemony, buttery coat. It is no distortion to say that this Chicken Piccata recipe always takes the cake on my family table every single time. Pair this Chicken piccata dish with pasta or mashed potatoes, or give it a shot of Pinot Gris. You’ve got what you need for either a quick and delicious midweek dinner or a fancy grandstander. This is the kind of fancy-tasting treat that leaves any fancy guest coming over in awe. Healthy chicken recipes are now taken to a higher notch! Moist, juicy and rich in taste with a creamy and tangy spice mix, the Tandoori Chicken actually calls for no special curry paste. All you need are the ingredients that are already within your kitchen space. Thanks to the one-of-a-kind smoky flavor, this dish has been on its way to a true food phenomenon for years. FYI, I decided to rock my recipe a bit just so I wouldn’t have to struggle with the long list of Indian spices. Curious? Watch how my Tandoori Chicken came out right here. Here comes the most popular variation of the meat-filling pot pie in the US! For the longest time, Chicken pot pie has been in the top 10 must-try American cuisines. The pie truly projects the image of the traditional American family meal. That’s presented so properly through its browned crusts, the tasteful filling and the mild, delicate flavor of chicken and vegetables. All in one pot. This Chicken Pot Pie‘s making process is plainly straightforward. With butter, milk and chicken broth all in harmony, a soupy, creamy and delightful filling is what you’ll get at the end. We also recommend refrigerated products and frozen vegetables for the sake of simplicity. There’s no need to be confused about changing and mixing the fillings up with your own devices anymore. Got cheat-meal cravings during dieting days? No more guilt trips: crispy tender Chicken Carnitas is the savior for today’s problem. This dish reaches a perfect tender texture simply by braising the pork meat and then quick-frying it with the seasonings. It’s simple math for you: spread the chicken breasts out in a layer, braise in the oven, then pull them apart to broil. The whole cooking process may sound complicated, but it actually takes you minimal effort to do it.. Final note: You should definitely coat Chicken Carnitas with Chipotle sauce, then top it with cherry tomato slices. It’s absolutely fulfilling! Chicken Korma is, no doubt the easy-to-prepmeal you’ve been yearning for. It’s elegant in display, naughty in taste, and inherits the distinctive flavor of Mughlai cuisine by adopting the meat-braising technique. The gravy requires only curry paste, tomato paste, pureed nuts and fresh ground spices to work together. This dish will surely give you the earthy kick of spices, yogurt and nuts altogether. The taste also varies from mildly spicy to super hot. Make a few tweaks yourself and your diet will still be on track. It does you no harm. Once you adjust your taste buds to Indian culinary, you’d just knock your socks right off. Once in a while, let’s also try Chicken curry with white rice, cauliflower rice, naan and roti, successively. They’re all stellar and delicious in their own ways. This classic Southern American chicken and dumplings is what I’d introduce to anyone who’s in the middle of sickness. Among all, the soft, pillowy little dumplings are my favorite. But still, they could hardly do their best without the combination of the aromatic chicken broth and tender chicken chunks. You will need a little boiling first, and then add fresh herbs and vegetables to create the flavor base of the soup. The ingredients will then come together mesmerizingly beautiful, providing an unforgettably fulfilling and cozy treat for the dreary days. What’s in your head right now? Is it a smoky hot, captivating dish (that’s somewhat a perfect match with a cozy tea break)? If yes, then you’re in the right place! Let’s check out this Tex-Mex style Chicken tortilla soup. It’s a mix of heaps of fresh vegetables, and the spicy enhancement from chili powder. This is the kind of soup that chases your taste buds and heals your soul. It’s yummy, earthy, and tastes like a regular cheat meal, but is actually in the top marked healthy chicken recipes. All you have to do is dumping things together, making a few adjustments according to your diet, then sitting down and beholding for a piping hot gourmet to be ready at your table! Another Tex-Mex home-made recipe in the list that replicates the restaurant repertoire in the list. Now, if I start by indicating how super easy it is to make such dish using plainly skillets, I might sound pretty much like a tricky fellow. But that is, in fact, how this Chicken fajitas is made. Okay so first, let’s try to spare some effort to find the ingredients within your spice cabinet. Doing that, you’ll have to bear no extra charge for fancy seasoning in foil packs, hence from this point on, things could appear a bit more whine-less. The remaining job, for you, is only stirring the ingredients together and cooking them on high heat, thereafter, shredding some cheese or simply spooning out a dollop of sour cream/Greek yogurt to call it captivating toppings. It seems that at times, when I get older, my craving for light and healthy dishes (the ones that come with heaps of veggies, in particular) simply ramps up day by day. Unlike the time when we were kiddos, healthy foods are now no longer the last resort, but unquestionably a necessity in our diets. At the crunch time, I found this Chicken and rice soup satisfied the exact heartiness I required. Additionally, the potato chunks and mashed potato flakes as add-ons really finish off the soup’s texture brightly and creatively. You’d surely want to dunk your spoon all the way in, feel renewed in just minutes, and can’t wait to spin out different versions the next time you make it. Alright guys, grab varieties of this Chicken Biryani and I assure you won’t regret it. It’s rich and pungent in flavor, and the fragrance is oh so enticing that it rivals any other healthy chicken recipes! Originally, by integrating coconut-infused curry paste and ginger garlic paste together, Chicken Biryani truly screamed the height of Indian cuisine. After having traveled through a few continents, now the dish is prepared by layering the ingredients successively, and either with or without the association of curry paste. Nevertheless, for Indian dishes, it’s still a should to incorporate home-ground spices, just so it keeps the authenticity in taste as best as possible. Finally, let’s put it together on a nice bed of basmati rice, and there you have one more family-pleaser meal to indulge in. Potlucks, parties, gatherings, even football game broadcasts — whatever the place, as long as Chicken Enchiladas is in the menu, count me in! Although Chicken Enchiladas is just chicken strips seasoned with herbs and leafy greens, it will always have an important spot at my family table as ‘those cute little rolls smothered in the red sweet, pleasing sauce and cheese’ – according to my mother. They’re even piled high with a whole range of toppings! Especially when the temperature’s starting to dip low, this dish is undoubtedly pleasant and hearty to the brim. Okay now we’re taking a glimpse into the filling: For home-made enchilada sauce, you’ll need chicken broth thickened with tomato sauce for the base. You will then need chili powder and ground cumin to enhance the authentic warmth and tanginess. Also, don’t hesitate to make minor amendments by adding your favorite veggies 😉 That way, enchilada sauce can be repurposed for tons of other dishes and not just this one alone. 20. Chicken And Rice Casserole – the healthy chicken recipe you can tell at a glance! Whenever you’re too worn out to come up with anything new, simply follow this recipe for Chicken and rice casserole. First, assemble the chicken strips in the baking dish, continue to place a layer of basmati rice and finally, another layer of mushroom soup and onion soup mix on top. Among other healthy chicken recipes, this chicken and rice casserole is complex in taste but surprisingly nice and warm. It’s a one pot shot, and the ingredients will undergo coalescence with other layers perfectly. You’ll find that the tender juicy chicken meat, chewy long-grain rice and savory mushroom gravy truly make a flavorful dance in your mouth. Extra veggie chunks would help increase the fiber content and add more crunchiness to the dish. It would simply hit your comfort button. Brilliant pleaser, in a nutshell. This Buffalo chicken dip is a perfect simulation in flavor of the we-all-know Buffalo chicken wings — and of course, much simpler in practice. The cream cheese base is second to none when it comes to making a dip to indulge in. Here you’ll easily find tender chunks of chicken smothered in dollops of mozzarella and cheddar – not to mention the tangy Buffalo sauce. Let’s scoop a mouthful of this dip with tortilla chips, shall we? Also, please feel free to make a few adjustments yourself. It is to see whether or not Buffalo chicken dip can make the best burst when you pair it with celery sticks and bread sticks. Whew, that was a bit overwhelmed just by taking a glimpse at each. But on the whole, chicken is a universal thing, and to the point that it should taste like a homey sophistication in no sophisticated way. Meaning you’ll see yourself winding these healthy chicken recipes up in no time. Come on, that’s what Luna is here for. I started running out of ideas on how to cook chicken. Hi Wreckless, I must say I’m beyond excited to see my picks actually helped you on crafting meals! Chicken is indeed the wonderful meat out there, and with each cut, you get brand new ways to process things. Yes! I also eat a lot of chicken. As I’m trying to lose weight I do bake a lot of the chicken I make. You have so many good recipes that I can’t wait to try it out! My freezer right now is full chicken breasts as I only like the white meat chicken. I’m so excited to have some go to recipes when I went out of my very limited ideas 😁 I’m so glad I found your page. Not sure which I’ll try first but I’m sure it will be excellent!